With the bishoujo figure industry firmly rooted in Japan, pricing for all figures flows directly from the Japanese MSRP in JPY (¥), which means that any serious collector living outside Japan should pay attention to how well their local currency trades against the Yen, as this directly affects your bottom line when buying figures. 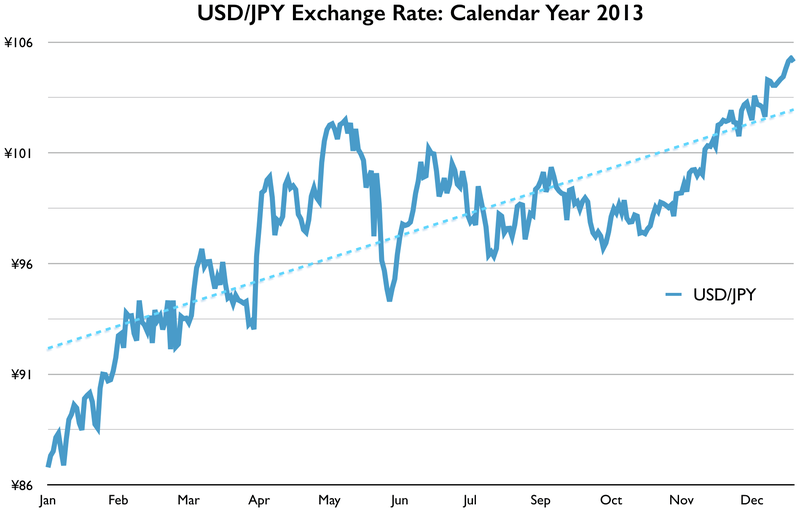 2013 was an exceptionally good year for the US dollar against the yen. A strong upward trend over the course of the entire year helped the dollar return from near-record lows around the ¥78 level as recently as October 2012 to its highest point since 2008. The dollar closed the year around ¥105, which represents a 21% increase since January 1st and a 34% increase over the October 2012 low. I had five open preorders entering the year from 2012. 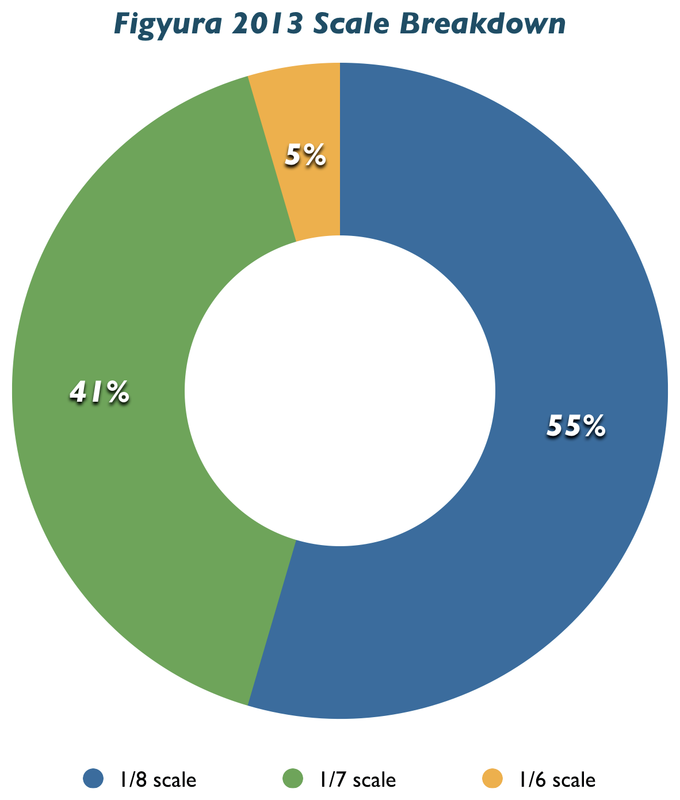 Let’s take a look at where these orders came in compared to my initial estimates. Thanks to Volks continually dragging their feet, I will still have one open 2012 preorder going into 2014, which is kind of ridiculous. I don’t personally have a lot of experience dealing with Volks, as both my other figures from them were purchased post-release, but I get the impression that these kinds of delays are more common than they should be. Leviathan and IA were covered in the mid-year report, but Suzuha and Lucifer are new updates from the second half. Both came in well under estimate thanks to the positive exchange rate movement discussed in the previous section. As outlined at the beginning of the year, the 2013 budget was split into two parts: a monthly rolling allocation strictly for preorders and a smaller lump sum allocation for everything else. I will address each individually below. 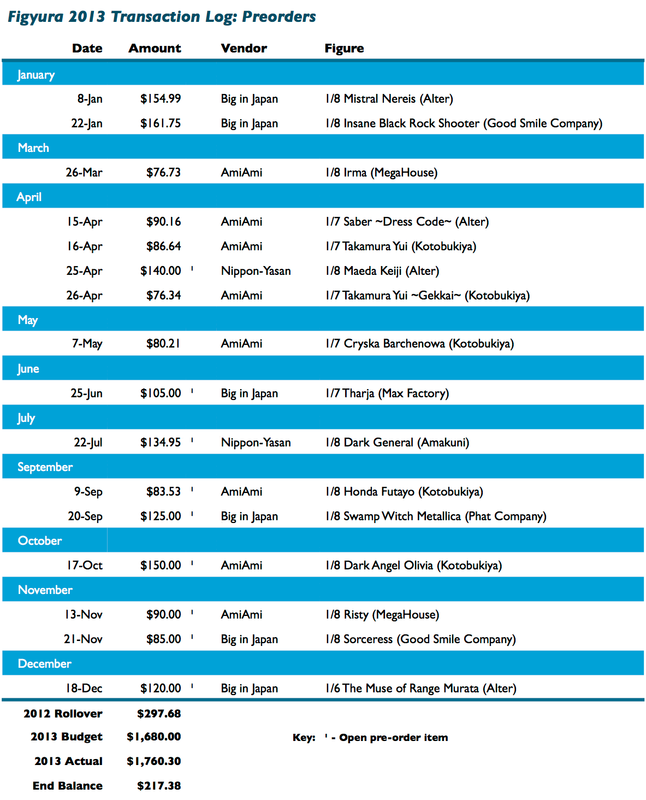 My preorder budget for 2013 consisted of a $140/month rolling allocation with a $297.68 rollover from 2012. Here’s how I used it. And now, the same set of transactions graphed over time. We can see that the rolling budget strategy is working as intended here, as the debit trend line follows the credit line in a roughly linear fashion. 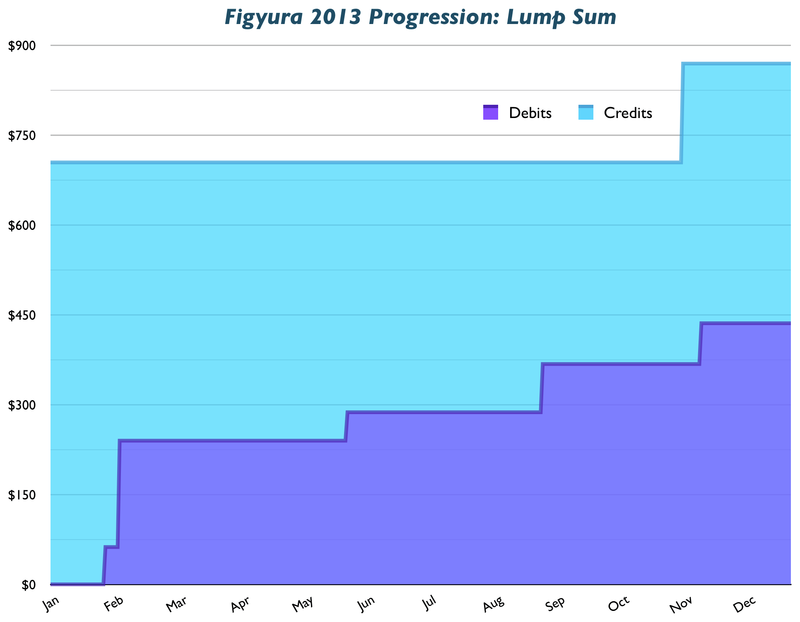 My lump sum budget for 2013 was $660 with a $44.30 rollover from 2012. Now, let’s see where that money went. And those same transactions logged over time. 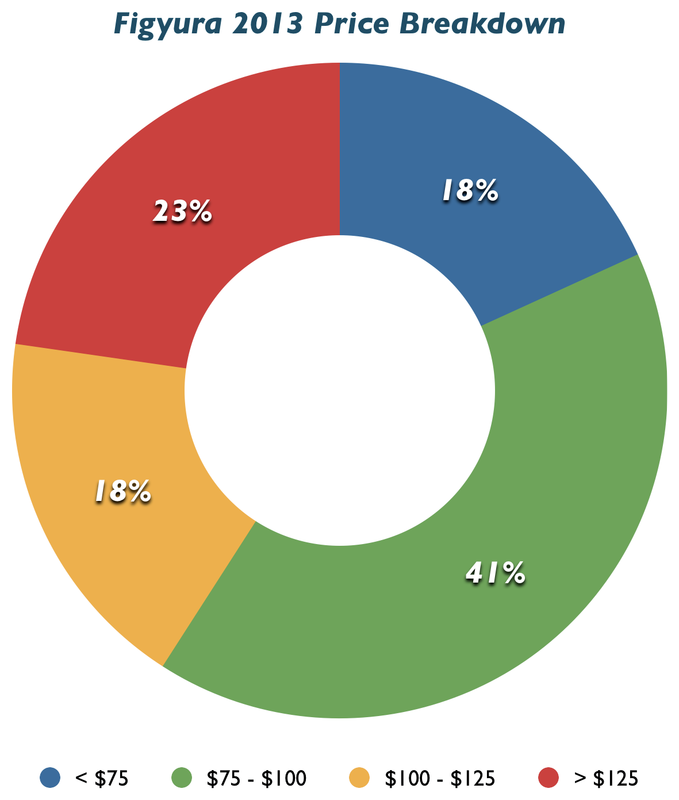 It was a remarkably restrained year in terms of spending for my lump sum budget. Historically, I have tended to spend early and often, resulting in rapid exhaustion of funds too early in the year. Indeed, this was the entire reason I switched mostly over to a rolling budget allocation several years ago. If this trend continues into next year, I will probably eliminate the lump sum budget and use the rolling allocation alone. The rolling budget strategy has done a pretty good job over the past couple years of helping me “keep up” with the figures I desire most as they come out, so I’m finding that there are fewer figures that I regret not purchasing than perhaps there was in the past, which means fewer targets to use the lump sum allocation on. Furthermore, those figures that are high on my wish list tend to be popular figures that have risen greatly in price on the secondary market and I’m not terribly keen on spending a king’s ransom on a figure like Alter’s Bounty Hunter Yoko when the same money could get me two or three other high-quality figures that are on preorder. Instead, I tend to use my lump sum funds to go after figures that I was on the fence about previously and which haven’t appreciated too greatly post-release. Max Factory’s Sansei Muramasa and Kotobukiya’s Mitsurugi Meiya are good examples of that strategy in use. 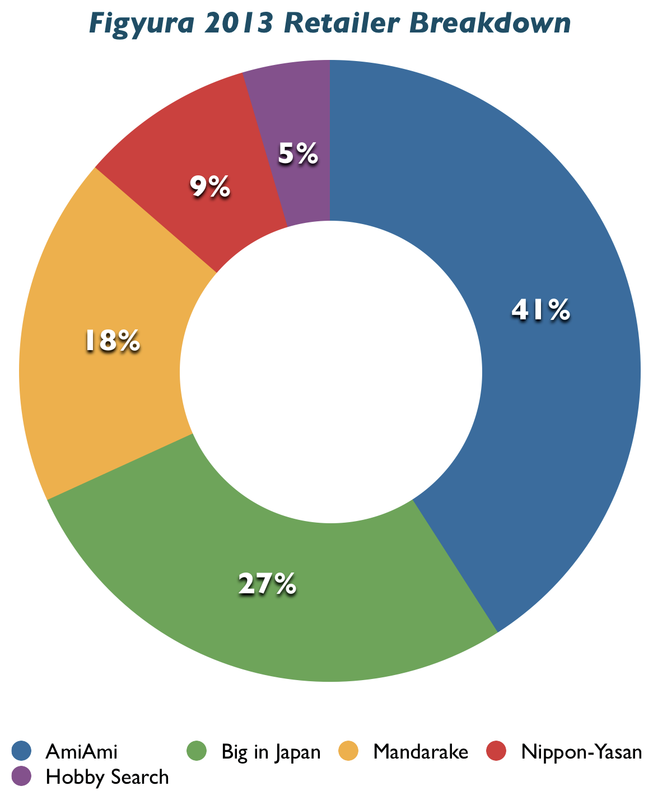 Taking both budget allocations into account, 2013 saw 22 new figures purchased, up from 15 in 2012. There were 14 normal preorders, two exclusive releases, six previously-released figure purchases, and nine open preorders at the end of the year. Alter has been a perennial favorite for as long as I’ve been doing this, so seeing them at the top here is no surprise. What is a big surprise is seeing Alter share that spot with Kotobukiya. I have not historically been a big Kotobukiya fan. They rarely made figures I wanted to buy and when I did buy, I came away disappointed with their work. 2013 represents a major reversal of that trend as I more than doubled my stable of Kotobukiya figures from four to ten and I was honestly quite satisfied with all of those purchases (or at least the ones that I have received). Having more options for high-quality figures can only be a good thing, so I hope Kotobukiya continues to work hard to earn my dollar. 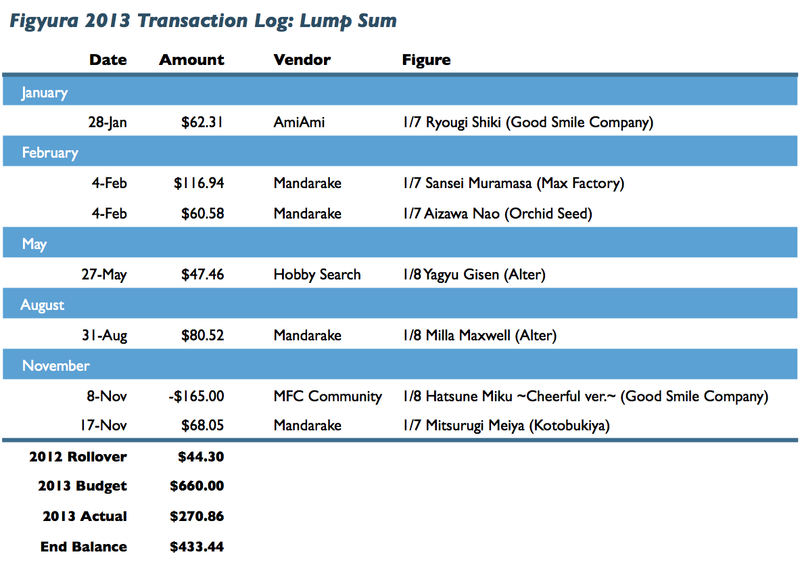 AmiAmi, Big in Japan, and Hobby Search are all shops that I have used many times before and trust, so seeing them account for the lion’s share of my business is no surprise. Nippon-Yasan is a new addition. They are the only shop located in Japan that I know of that does not require a deposit on a special order item such as a Hobby Japan or Native exclusive. After being on the wrong side of the currency rate trend with my Leviathan preorder, I decided to give NY a shot to avoid making any premature currency exchanges in the form of a deposit. Neither of my two NY orders has come in yet, so it’s too early to say whether or not they will become a mainstay going forward. Mandarake’s presence is also a bit unusual. I have done business with Mandarake in the past, but it was always one-off orders or non-figure goods such as artbooks and doujinshi. This year, thanks in part to the excellent FigInStock alert service, Mandarake became my primary source for finding wish-listed figures post-release. I even scored some nice deals through them, such as Orchid Seed’s Nao and Kotobukiya’s Meiya who were available unopened on Mandarake post-release for less than they were during the preorder phase from shops like AmiAmi. The effect of improved exchange rates can be seen in full effect here. The $125+ segment accounted for nearly two-thirds of my purchases in 2012, so seeing that drop back to less than a quarter, as well as the re-emergence of the $75- range, which has been almost non-existant in the past couple years, is a promising trend. The average purchase price was $99.83 across all purchases, $110.02 for preorders, and $72.64 for the lump sum budget. The 2013 scale breakdown panned out very similarly to 2012. 1/8 was the dominant size, followed by 1/7 with a modest share, and 1/6 accounting for a very small portion (one, in this case) of all purchases. It’s disappointing to see so few 1/6 scale figures, as that’s really my favorite size, but 1/8 scale has clearly been the mainstay of the figure industry for as long as I’ve been collecting and larger sizes become less and less common the larger you go. I doubt this trend will change anytime soon. 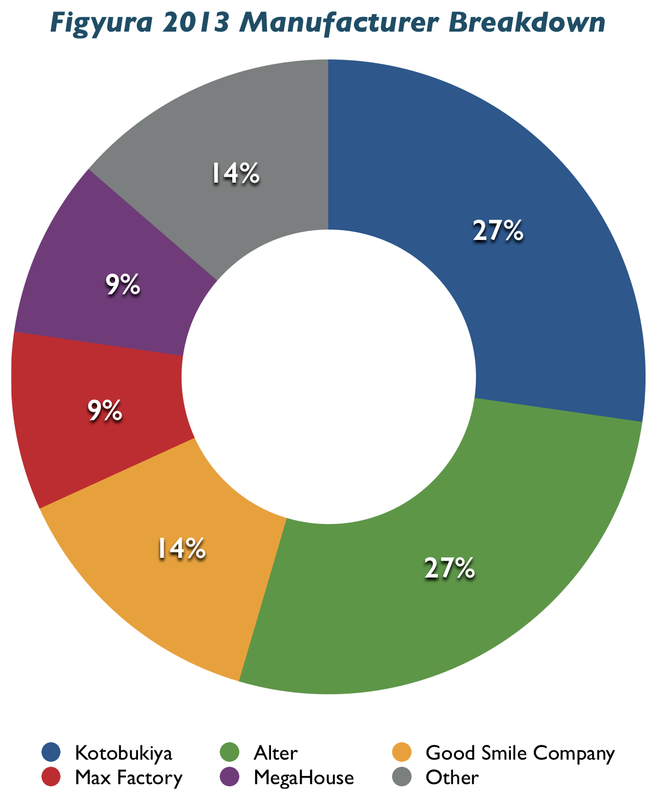 I made minimal changes to my budget strategy between 2012 and 2013. Things seem to be working as intended here at the end of the year, so I expect to make minimal changes for 2014. I will follow up with a brief post in the next week or so outlining any tweaks to the budget for 2014. 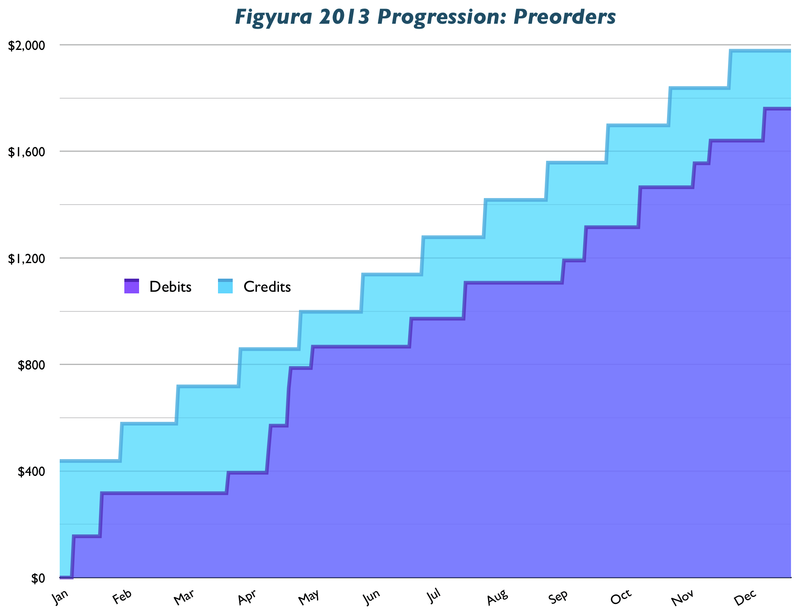 My open preorder total is up a good bit from last year and I will carry a modest rollover sum for both budgets, which means plenty of new figures to look forward to arriving in 2014. To my fellow collectors, did you have a budget strategy for this year? If so, how did it pan out? Are there any changes you would make going into the new year? The Yen got really cheap, Im always surprised when I look up the currency converter before ordering. In this year I ruined my figure collecting experience a bit with many “unnecessary” figures, either they didn’t look like expected or I quickly lost interest in them, I also got some really lovely figures this year, so it’s not super bad. In 2014 I’ll buy less, around 20 figures would be a good goal for me. without delays I would have received 33 figures,talking about burning display space within a few months. I nearly fell off the chair as Tharja was delayed how unpleasant, the other 3 delays were ok though. I don’t have any hard numbers to back this up, but I feel like the ¥9000+ “premium” figure pricing has become more common in recent years. I would chalk it up to figure design becoming progressively more sophisticated, ambitious, and complex, which must drive up the cost of manufacturing. Fortunately, the improving currency exchange rates help offset the inflationary effect. I’m not too bothered by Tharja’s delay. Max Factory is a pretty consistent manufacturer. I have great confidence that she’ll be worth it in the end. 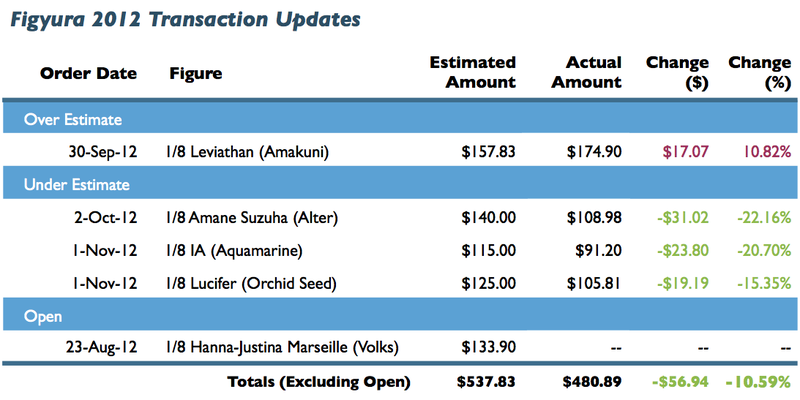 I’m more concerned about Volks and my Hanna-Justina order, which just seems to be slipping indefinitely.